It’s officially wedding season, as brides and grooms-to-be across the country prepare to walk down the aisle in spring or summer. 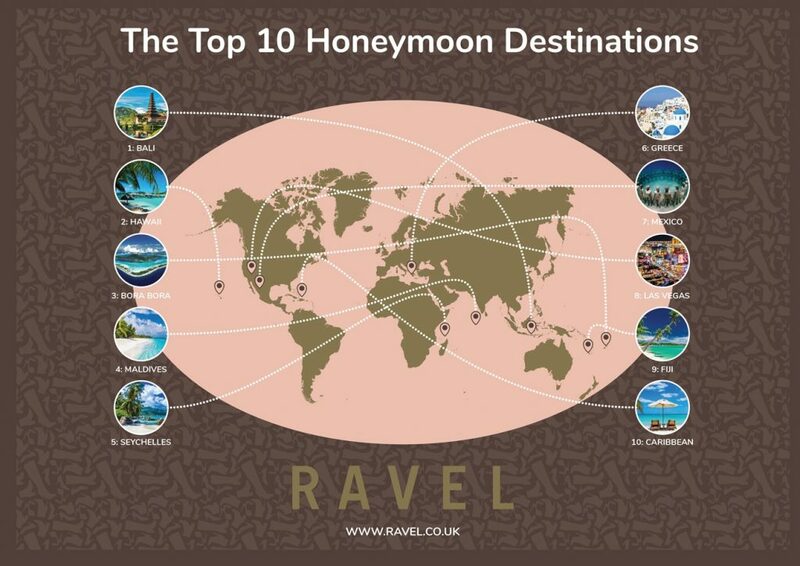 In the spirit of the season Ravel took a look at the most searched proposal, wedding, honeymoon, hen and stag queries to see what brides and grooms-to-be were looking for before the big day. The proposal is where it all begins. If you have planned it well you will manage to catch your other half off-guard, or maybe you have already discussed your future so it is anticipated. There are many ways to propose, the key is to find a way that suits your and your partner, whether that be a low-key home proposal or a big-scale attention grabber. When we delved into our search results, it seems most grooms-to-be were searching for the classic, romantic dinner proposal. Searches around dinner proposals included looking for local restaurants that fit the bill to searching for ways to pop the question over dinner. Don’t forget the classic ring in the champagne if you’re stuck for inspiration. Perhaps surprisingly, the second most popular way to propose was to organise a flash mob. Granted, a flash mob isn’t for the shy couple. The reason this method could be one of the most popular searched is the planning and organisation it would take, as your proposer would have to recruit a team and find a suitable venue. Many of the ways to propose stuck to tradition. 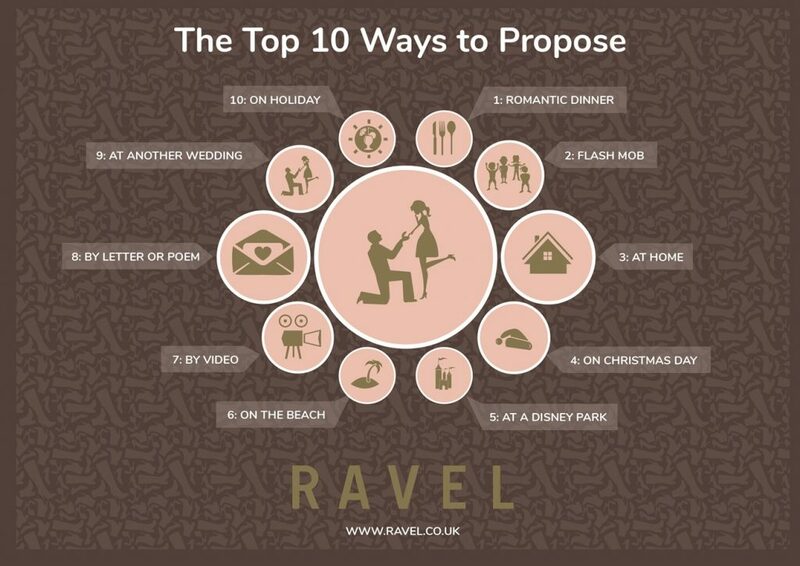 Proposing at home, at the beach and on holiday all made the top 10. Other methods making the list, however, had more controversial ideas included. Coming 9th in the top 10 ways to propose was ‘at another wedding’, we can’t imagine the happy couple on the day being too thrilled with a proposal happening to steal their thunder. Other ways to propose included taking their partner to a Disney park to ask the question, with another being to offer the ultimate Christmas present by asking on Christmas Day. We’d hope the recipient of a Christmas Day proposal would be inclined to say yes or that could make for an awkward turkey dinner with the family later on. Both stag and hen dos can be had in the UK and abroad, depending on your choice and budget, but where are people commonly looking for a girl’s or lad’s getaway? We have the answers for both UK and international options. 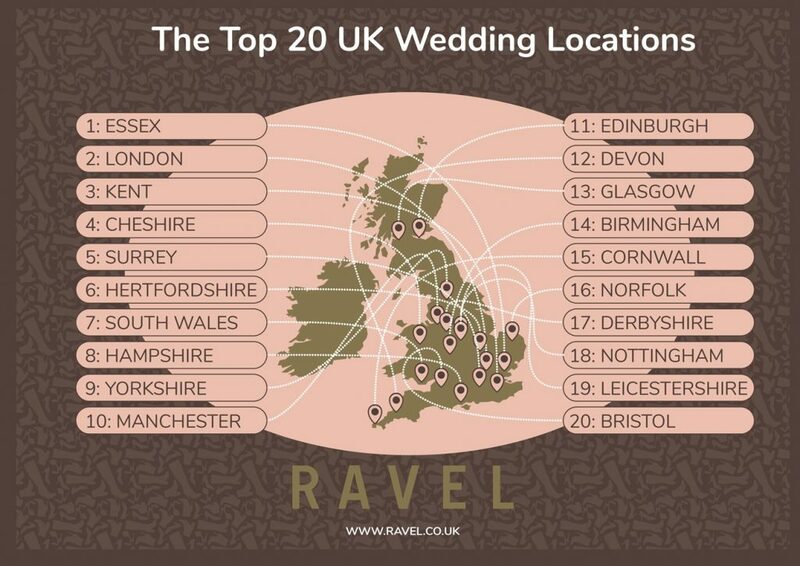 In the UK it seems brides are searching most commonly for hen parties in Liverpool, whilst grooms are looking south at Exeter most commonly. For hen dos the top take covers most corners of the UK, including London, Edinburgh, Manchester and Belfast all in the top 10. Other locations included Newcastle, York, Bath, Glasgow and Brighton for hens. The top UK stag locations had a lot of crossover with the hens, but with the inclusion of Exeter, Cardiff and Nottingham in replacement of Glasgow, Bath and Belfast. It seems both stag and hens are happy to travel anywhere in the country to find the perfect party spot to enjoy a last night of freedom. There were more differences in the choices of stag and hens internationally, as the top destination for stags was Prague and the top choice for hens was Marbella. It seems the ladies prefer a bit of sun whilst the guys are more keen on a city break. 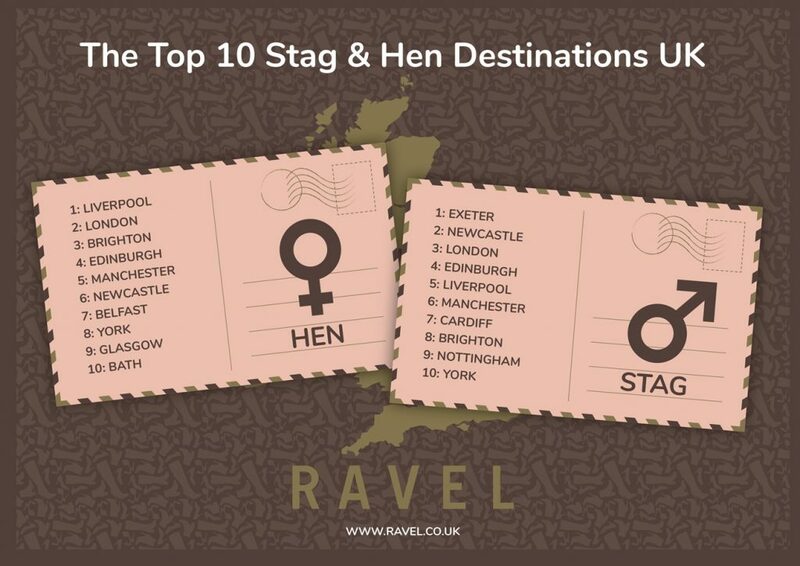 In the top 10 hen locations a few sunny destinations made the list, Ibiza, Benidorm, Croatia, Magaluf and Barcelona. Alternate places which offer more variety for hens included; Paris, Las Vegas, Dublin and Amsterdam. Luckily at Ravel we’re prepared to style out any manner of hen do with our choice of sandals and heels. For the stag do choices, cities were more present and guys were searching for more unusual places to visit with Riga, Budapest, Bratislava and Krakow in the top 10. Other top searches included; Amsterdam, Dublin, Hamburg, Barcelona and Benidorm alongside Prague. The choice of whether to stay in the UK or head further afield doesn’t just apply to the stag and hen dos, as research showed more search for weddings abroad occur than for those in the UK. 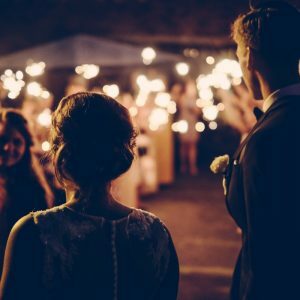 The top locations to get married abroad included both cities and countries, showing the split between engaged couples knowing exactly where they want and those searching more generally for ideas. Italy came out top as the most popular place to get married abroad for Brits, which is hardly surprising considering the range of cities and islands you could choose from. The top 3 also included Santorini and Cyprus as the next popular destinations. Las Vegas came 4th, perhaps for quirky couples who want a no-frills wedding that you might see in the movies. The remaining list featured Mexico, France, Portugal, New York, Caribbean and Spain. 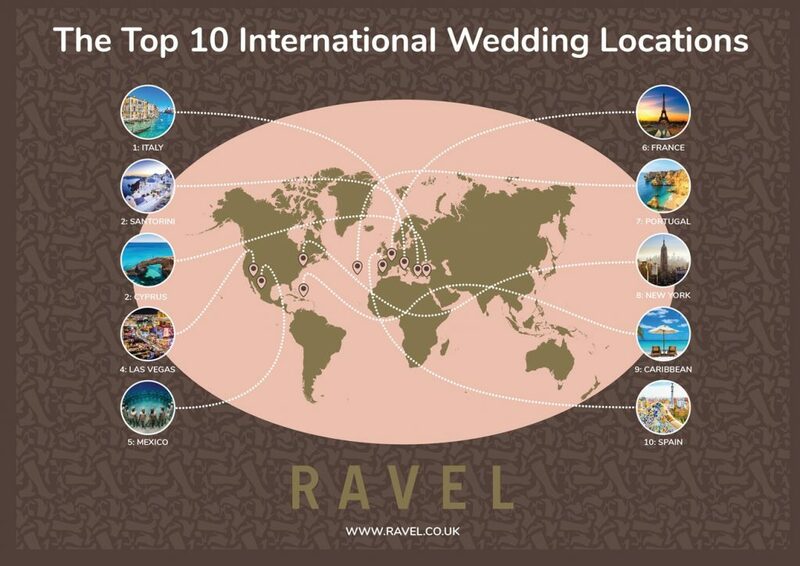 When looking a little deeper into search results, the top 3 types of international locations proved the beach to be the top spot to tie the knot abroad. Coming 2nd and 3rd were the venues of chateau and a Disney theme park. All three would make for a magical day and set the perfect backdrop for a wedding, just imagine the wedding photos! In the UK, Essex was the most searched place for couples to look for weddings. Essex was followed by London and Kent, proving the South East in general to be popular. Cheshire came 4th overall and top of the north of England. Manchester and Yorkshire also featured in the north. South Wales, Hampshire, Surrey and Hertfordshire all also made the top 10. In terms of venue types, Brits staying at home for their weddings preferred traditional venues. 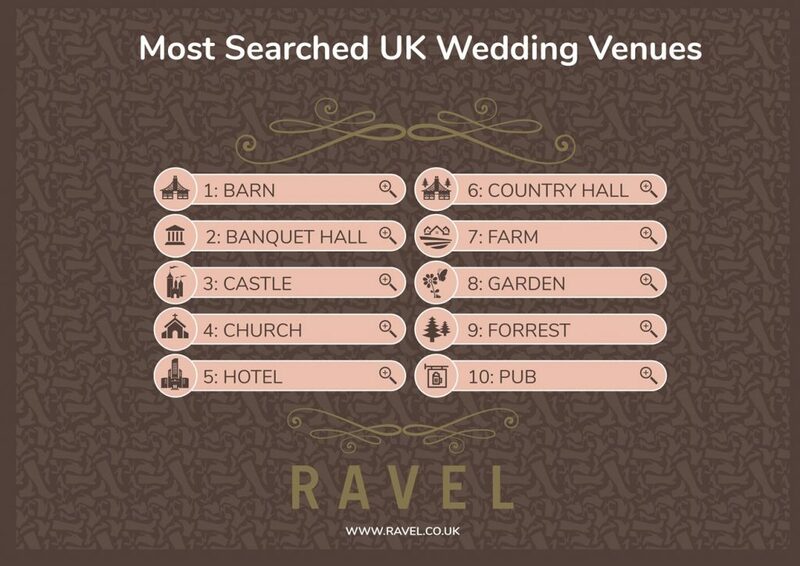 The most sought after venue for UK weddings was a barn, followed by banquet hall coming second and a castle in third place (a girl can always dream). Typical options including churches, hotels and hotels all made the list but some couples were looking for more low key venues like farms or even pubs. Once the big day is done you can finally look ahead to a nice honeymoon, but just where are most Brits looking to getaway? Our results showed a definite preference for tropical backdrops and beach destinations, with the top 3 being Bali, Hawaii and Bora Bora. This was closely followed by the Maldives and Seychelles, continuing the trend of instgrammable beaches playing a part. Just think of the newlywed selfies you could take in one of these locations! The remaining five in the list included Greece, Mexico, Las Vegas, Fiji and the Caribbean. This didn’t leave much room for city breaks, but we can’t blame couples for wanting a paradise-like holiday to celebrate their new status as a married couple. Get the perfect wedding shoes to suit any venue with Ravel.